everybody in a thrall of discussions around high-tech platforms like Artificial Intelligence and Augmented Reality at which concluded in Goa recently, it was the Bollywood actors, iconic sports persons and singers that brought a tear and a smile to everyone’s face. 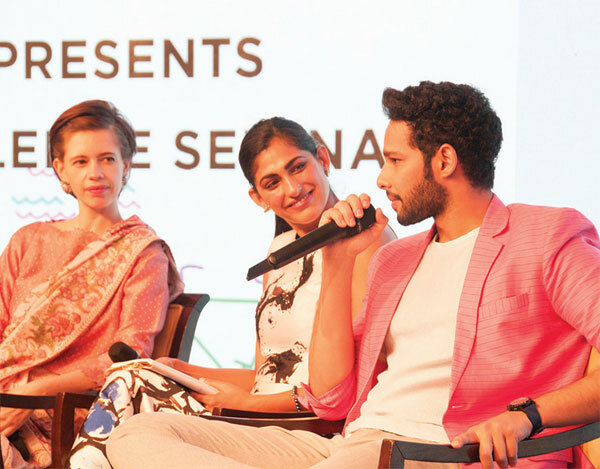 While singer Shaan kicked off the entertainment quotient on day one of the festival with his foot-tapping numbers, it was Bollywood actors, Kalki Koechlin of ‘Margarita with a straw’ fame and Siddhant Chaturvedi, the MC Sher of ‘Gully Boy’ fame who had everybody’s undivided attention on day two, as they recounted their Bollywood journeys. Kalki is French and grew up in an international settlement in Auroville. Surprising everyone with her fluent Tamil, she mimicked the manner in which she and her local childhood friends used to tease expats who walked past, little realizing that she was an expat herself! Kalki was candid when she spoke about her struggles in the film industry. “Just imagine my discomfort, when a film producer casually suggested that I get some Botox treatment for my laughter lines!”. The young Siddhant Chaturvedi (just 25) and a chartered accountant by training has made a big impact with his role as MC Sher in the box office hit, ‘Gully Boy’. The actor told interviewer Kubra Sait, “Most casting directors started picking me for my ‘cute’ looks!” the affable actor said and laughed out loud. Post the actors’ session, it was the turn of Indo- Canadian singer Jonita Gandhi, who has been making waves in Bollywood backed by a three-man band, the young singer gave ample demonstration of her immense talent. Day two concluded with cricketer Virender Sehwag regaling us with his joke-a-minute repertoire. Speaking in chaste Hindi, this native of the Najafgarh suburb of Greater Delhi had everyone in splits, when he mentioned how his ‘advice’ had resulted in team mates like Tendulkar and Kumble losing their wickets in international matches. The former star opening batsman of the Indian team rated Sourav Ganguly, MS Dhoni and Virat Kohli in that order for his choice of ‘best leader’. Emerging Bollywood singer Mohammed Irfan’s soothing voice kept everyone awake in the first session post lunch, as he belted many a romantic melodies in rapid succession. The entertainment curtain was brought down by talented actor, Pankaj Tripathi of Gangs of Waseypur and Newton fame when he was expertly interviewed by film journalist, Anupama Chopra.